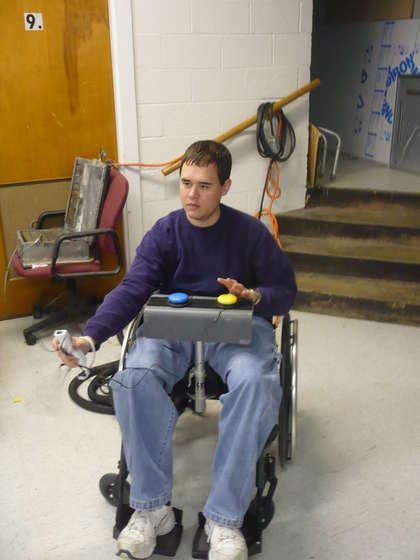 [Catea] has put some considerable effort into making a wiimote more accessible to people with physical disabilities. He started by extending the buttons out to much larger versions mounted on a lap tray. This makes playing games much easier for those that are lacking the fine motor skills to hit the buttons on the wiimote. This alone is a pretty substantial improvement, but [Catea] wanted to do more. Taking the whole idea further, [Catea] published a second instructible where he outlines the process of adding two Arduinos and Xbee modulse to make the external buttons wireless. lol @terribledamage does that apply to people with social disabilities as well? It might be easier to use a Nyko Wand wiimote instead of the original because Nyko has a customized version of the expansion port that allows extending the buttons. is there a moderator to remove these sorts of posts? I love the hack, I’ve lost one of my joints on my right thumb, and most console games I can’t play– I would love to come up with something to replace the analog sticks, but haven’t figured one out yet. yes, we’re here to moderate, I was just away from the computer for a little while. I think I recall seeing someone relocate one of the analog sticks to the bottom of the controller so that it could be controlled by pressing the controller down to your leg and moving the entire thing. This format would only make sense for someone with a thumb issue as it would still require fine motor skills. no one return from other side to tell us that it exist somewhere else than in ours minds. Seriously this life most likely the only lucky chance of having consciousness before yours brain start rotting (yours probably already in bad shape). With series 1 Xbees, couldn’t you use DIO passthrough and eliminate the need for the Arduinos? karthik ram liked Arduino MKR touchscreen for top wall mounting.